Vince Camuto Katrina Booties Block Heel sz 10 Brown Leather Boots . These are new without the box. These are great booties! You will look great this summer in these great boots. Shipped with USPS Priority Mail. Shoes have never been worn. Model: Bendra. Vince Camuto thigh high boots. 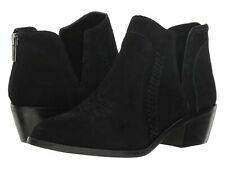 The footwear is marked USA size 10 M.
Vince Camuto ankle boots. Model: Hadley. These mark not affect the condition of item/s. Condition :Gently used. good used condition. Sign of wear in the heel and the sole. Zip on the side. if you have any issues or concern when you receive the item/s. You are buying a very nice pair of Vince Camuto boots. Black in color with some Gold areas on heels and buckles. Never worn but they do have several scratches on Gold from closet.They are mid calf in height. A chunky stacked approx. 1 3/4" heel adds just enough height without sacrificing comfort. Backzip closure.Leather upper/synthetic lining and sole. Excellent condition; not in original box. Vince Camuto Womens Black Linford Tassle Fringe Ankle Bootie US 4 M Mint Cond. Vince Camuto Womens Black Linford Tassle Fringe Ankle Bootie US 4 M. Mint condition. 3.5" heel. New without box. Vince Camuto Chunky Ankle Heel Perforated Distressed Booties Taupe Sz 8. Very minor Faint slightly darker area on right upper due to material rubbing. Could easily come off. Feel free to ask any questions. PLEASE check out my other items both NEW and PREOWNED Items: Thanks for looking! Outer zippers are for decoration only. Regionally inspired but stylish anywhere, the low-heel Thally works with cutoffs, jeans, anything! The Thally Suede Bootie will complete any stylish outfit. Vince Camuto Thally – Western Bootie. - Top-stitched vamp. VINCE CAMUTO WEX MOTO BOOT. GOLDEN BRASS LIKE BUCKLE WITH THE FAMOUS VINCE CAMUTO LOGO. VINCE CAMUTO LOGO INSIDE BOTTOM OF THE BOOT. ZIPPER ON BOTH SIDES OF BOOT. BLACK LEATHER. ONE FUNCTIONAL~ONE FAUX DECORATIVE. Vince Camuto boots, like NEW, Size 8. Condition is Pre-owned, worn twice. Looks brand NEW. Very comfortable and Beautiful Shipped with USPS Priority Mail. 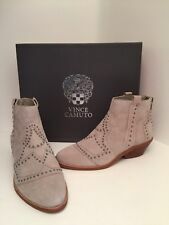 Vince Camuto Size 10 Prasata Gray Suede Perforated Ankle Boots. Excellent used condition. Shipped with USPS Priority Mail. Vince Camuto Panthea Suede Leather Exposed Ankle Booties Womens 7M Black Condition is New with box Shipped with USPS Priority Mail. Stunning VINCE CAMUTO Ladies Laser Cut Suede Booties Size 10M. Condition is Pre-owned. Gently used laser cut peep toe heels, worn 4x. Great condition purchased from Nordstrom Please see photos for wear, no returns. Happy Bidding! Shipped with USPS Priority Mail. Inseam: From crotch seam to the bottom ankle hem. || Waist: Laid flat, so double the number to get the total length around. || Sleeve length: Armpit seam to cuff. We want you to receive a product that you are excited about! Vince Camuto Leather/Suede Boots With Chunky Heals. Vince Camuto Suede & Leather booties with block heels. WORN ONCE! vince camuto kamille black leather peep toe heel booties SIZE 7 M. Condition is Pre-owned. Shipped with USPS Priority Mail. 4 inch heels please see pictures for condition- light scuffing in back- still in great condition! Vince Camuto Brooklee Leather Over-the-Knee Boots. Gently used black suede booties with cutout. Low heel, perfect height, comfy for everyday wear. In great shape, from smoke free home, only worn a few times as you can see in pictures. Size 8, true to size. EUC stands for "Excellent Used Condition". not have a strong/super noticeable odor., we always refer to zappos shoe size conversion chart. our intention to mislead or send an order your way without disclosing all we can about your item. VINCE CAMUTO FRANCIA BOOTIE Women's Size 9.5 M Tan Suede Ankle Boots EUC!! Note, lightings and device settings can make small differences on the color tone of the pictures. Honesty and Integrity is what our number 1 concern. Adorable super soft tan leather ankle boots booties shooties with a cone 3.75" heel, back zip, by Vince Camuto. Size 6.5 So cute! Vince Camuto "Raina". Style: Gray suede silvertone studded booties. Cut out at arch. Round pointed toe. Super cute booties, perfect to wear year round! Always look at the pictures, because a picture is worth a thousand words. Vince Camuto. The side zipper on the shoes. Net proceeds from the sale of these goods and financial donations from the community make it possible for us to operate our free job training programs. SEATTLE GOODWILL'S MISSION. Worn maybe once... stop have duster bag. vince camuto booties 8. Condition is Pre-owned. Shipped with USPS Priority Mail. Excellent condition only worn a couple times. The shoes sole is painted. Super cute wedge booties from Vince Camuto! These are new and never worn. Suede upper/textile and synthetic lining/synthetic sole. Vince Camuto Katleen Open Toe Black Distressed Suede Booties 8M. Super cute open toe, inner zip and brown block heel. Condition is Pre-owned only worn twice. Shipped with USPS Priority Mail. Length 9 1/2". Excellent Condition - Like New. Zipper closure 3 1/2" on the interior side of shoe. Vince Camuto Ankle Boots Brown Women's 7 . Condition is Pre-owned. Shipped with USPS Priority Mail. Barely worn excellent condition A little bit of discrepancy in the dye a couple of places..very minor scuffs Leather upper man-made sole platform 4 3/4 inch tall Smoke and pet free home If you have any issues, please contact me before you leave feedback. Like New ! Vince Camuto VC Valentina Black Leather Booties Size 6.5. Condition is Pre-owned. Shipped with USPS Priority Mail. Worn only once for an evening out with friends .